Chiyop Wei from the Traralgon City Soccer Club has won the 2017 GippSport Most Disciplined Player Scholarship for Boys. Chiyop was nominated by his club for his contribution on and off the pitch. According to the club’s Junior Coordinator Amanda Whitmore, he is a great role model and mentor to younger members in the club. “Chiyop has an ambition to become a referee and volunteers much of his time to referee small sided games, primary school soccer events and now commutes to the Gippsland Football Club Under 13 team each Sunday to fulfil the Assistant Referee role,” said Amanda. As a junior player at Traralgon City, Chiyop is always polite, well- mannered and happy to volunteer his time and skills to benefit others within the club community. GippSport Executive Officer Barry Switzer presented Chiyop with a scholarship to the value of $400 at the club’s very well attended presentation night on Sunday. This will assist with expenses associated with the FFV Referee Training Course Chiyop will now be able to attend. The Traralgon City Soccer Club also received a cheque for $100 for providing the nomination. 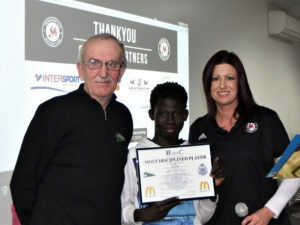 “GippSport is very keen to promote young people like Chiyop who not only participate in sport, but also make a contribution off the field of play. His parents, club and school are justifiably proud of him. It was great that this very successful club found the time to nominate him,” said Barry. GippSport, Victoria Police and McDonald’s Family Restaurants combine to make the Most Disciplined Player program possible for junior sporting clubs in Gippsland. Clubs are encouraged to join this free weekly program and are encouraged to provide nominations for this scholarship on an annual basis.